The following is presented in a spirit of openness and sharing for the benefit of anybody interested in resin and anchors. There will be people who have information about resins that I don't know so please share it and I'm more than happy to be corrected. Problems with resin have been experienced in testing and crucially we know that problems with resin have been experienced in the installing of anchors and have been found to be the cause of failed anchors. The correct use of resin is by far the most important consideration when installing anchors. All the information below is still of interest, however, after around three hundred anchors had been installed in caves using Fischer FIS V resin three anchors were found to show slight movement. I was very disappointed by this and made the decision to change to a higher performing resin. The resin chosen was Fischer FIS EM Plus which is an epoxy resin. Epoxy was chosen because it has very low shrinkage. Resin shinkage is thought to be the main factor in anchors coming loose. The reason for choosing FIS EM Plus is because it uses the same cartridges as the FIS V resin and it is also quite easy to obtain. 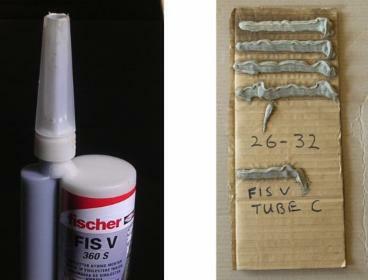 Fischer give good technical suport and provide far more product information publicly than any other fixing company. During devlopment of the anchor and after several consultations including the Fischer Technical Department, it was decided to use styrene-free vinylester (alternatively/formerly called epoxy-acrylate). The testing of all the prototypes was carried out in concrete using Rawl R-KER resin. During the course of testing anchors set in limestone using Rawl R-KER some anchors failed at peak loads which were low outliers and this was identified as being due to poor mixing of the resin. I then set out to learn more about resins and how to avoid poor mixing. Both Rawl and Fischer give instructions on how to use their resin systems and if instructions are followed correctly the products of both companies should perform as intended. The resins work by mixing two components delivered to a mixing nozzle from two cylinders. With vinylester resins one component is a blend of polymer, monomers, a mineral aggregate and other additives to adjust its viscosity. The other component is a curing agent or hardener with a colouring agent. Rawl R-KER is a vinylester resin. FIS V is a 'vinylester hybrid mortar' which is a vinylester resin with the addition of cement in the polymer blend and water in the hardener. Both resins are suitable for use in wet conditions; they will adhere to damp rock. FIS V is not recommended for use in water-filled holes whereas R-KER can be. FIS V uses a side-by-side cartridge made up of one cylinder holding the polymer blend and another smaller cylinder attached to the side which holds the hardener. R-KER uses a coaxial cartridge where the smaller cylinder is within the larger cylinder. The two systems require different guns. An older and less expensive type of resin is polyester. Allgrip KMR RES uses coaxial cartridges and the same gun as R-KER. The larger cylinder contains an 'unstaturated polyester resin in styrene' and the smaller cylinder contains a catalyst curing agent. Polyester resins are used in car body filler and for glass reinforced plastic. Resins containing styrene are banned in many European countries but not in the UK and only one small company makes a cartridge dispensed styrene-containing polyester resin in the UK. For those reasons resins containing styrene were ruled out for use with the IC anchor. There is a piston in each of the cylinders. The coaxial cartridge has a piston like a doughnut. The side-by-side cartridge gives a 5:1 mixing ratio and the coaxial cartridge gives 10:1. It is possible to peal back the labels and see the components through the translucent plastic. Rawl cartridges are packed in boxes with the front end of the cartridges pointing up. Cartridges should always be stored and transported this way up. All cartridges have some air in them which can been seen more easily by pealing off the label. The larger cylinder always has a few cubic centimetres of air. The smaller cylinder which contains the hardener can sometimes be seen to have air in it. It is possible to expel each component separately by pushing down the piston with a rod (don't try this at home). The photo on the left shows the polymer blend component of R-KER and FIS V. On the extreme left you can see the R-KER standing in folds whereas the less viscous FIS V in the next jar has run across the bottom of the jar. The photo on the right shows the hardeners of R-KER an FIS V and you can see that the hardeners of both are more viscous and stay as a blob on the bottom when the jar is tipped over. You can also see that the FISV hardener contains water which has condensed on the inside of the jar. If cartridges are kept upright and the air is at the top, when the resin is first expelled the air comes out first and it is possible to see that there is no air bubble left in the larger cylinder. However, air bubbles sometimes can be seen in the hardener of FIS V and these bubbles do not move to the top as easily as in the polymer blend. Most FIS V cartridges can be seen to contain no visible air bubbles in the hardener. The centre cylinder of a coaxial cartridge can't be seen so there might be air bubbles in it but we can't visually check whether or not there is any air present. If you do not know to do otherwise you might leave cartridges rolling about in the boot of a car. When a cartridge is taken to a cave, crag or test site it might be put in a tackle bag and dragged through crawls or dropped to the floor. So if it started off with air in it, the air might be anywhere within the cylinder when it arrives at the place of use. You would normally put a nozzle on the cartridge and expel some resin through the mixing nozzle until you are happy that it is properly mixed. You might do that with the cartridge pointing down so the air is not at the front and does not come out. If you then point the cartridge upwards to install an anchor in an upwards hole, the air can rise in the cartridge and into the mixing nozzle disrupting the mixing ratio. Method for ensuring there is no air present when dispensing resin. It is essential to ensure that no air bubbles are expelled into the mixing nozzle when dispensing resin for use when installing an anchor. The way to do that is to ensure that there is no air in the cartridge before taking it to the place where the anchor is being installed. Store and transport cartridges upright. Take a new cartridge and look to make sure that the air is at the top. I have a nozzle which has been cut short and is used to expel air from the cartridge in the same manner as expelling air from a hypodermic syringe. Put the short nozzle on a new cartridge. With the gun, squeeze the trigger until both components have entered the nozzle. Remove the nozzle, clean the end of the cartridge with a rag and replace the cap. You can clean the short nozzle and use it again. You must do this with all new cartridges. Samples of resin taken before and after installing an anchor can vastly improve the chance of detecting badly mixed resin. When installing anchors for testing I always expel resin onto cardboard until I am happy with the mix. I then install the anchors and afterwards expel another sample onto the cardboard. When installing anchors it is not difficult to take before and after samples. The sample could be expelled into plastic bags or other container. They could be expelled onto cardboard or in some cases just onto a handy ledge and left to harden for an hour or so or until the installer returns to remove the warning tag from the anchor. Resin doesn't adhere strongly to dirty rock and can simply be picked up when set. There would be no need to keep these samples, just inspect to make sure it is properly cured and dispose of it. The reasons why I have decided to use FIS V resin are as follows. The polymer component is less viscous and the air moves more easily to the front of the cartridge. Occasionally I have seen pockets of air in the hardener but this is not often. It is not easy to make the air move in the more viscous hardener so those cartridges have not been used for installing anchors. The important point here is that you can visually check that there is no air in the hardener in a side-by-side cartridge whereas you can't do that with a coaxial cartridge. The correct use of resin is by far the most important consideration when installing anchors.